Meet Ms. Deborah Sanguineti, the granddaughter of the prolific pinter Ms. Nenne Sanguineti who created the seven 20ft high mosaics of the Enda Mariam church in Asmara, among many others. Today, Q&A shares a bit of the story of Ms. Deborah Sanguineti, executive director and curator of the U.S. collection of Nenne Sanguineti Poggi’s artwork. Ms. Sanguineti Poggi was a very prolific painter and she had numerous exhibitions and received many awards during her time in Eritrea. Q : Would you tell us about yourself? Q : What is your connection with Eritrea? 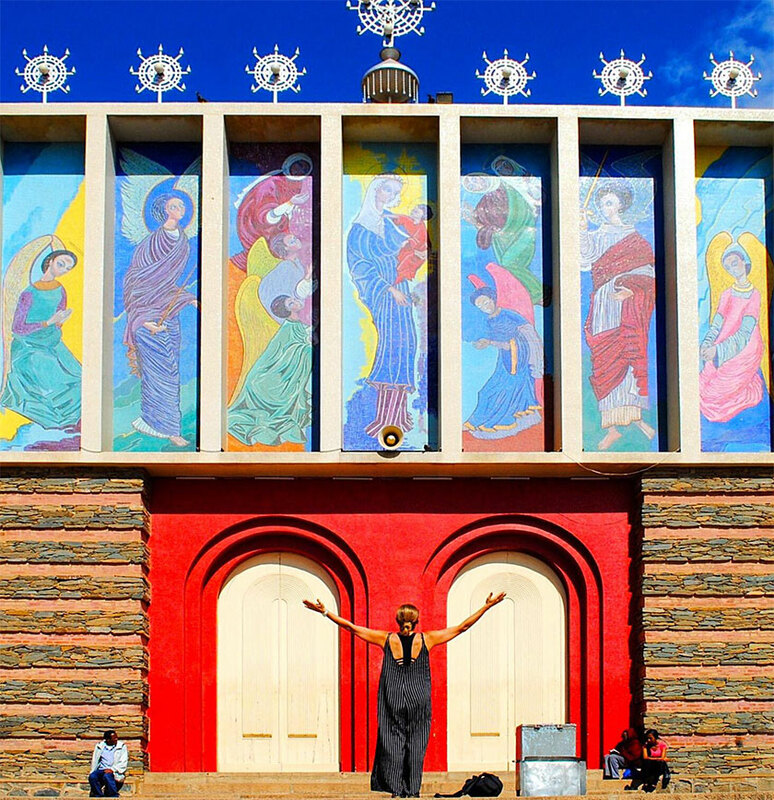 Ms. Deborah Sanguineti graciously standing in front of the seven 20ft high mosaics of the Enda Mariam Church that her grandmother Nenne Sanguineti painted. Q : Would you elaborate on that? My grandfather was organizing the delivery of oil to the Italian troupes from Port Djibouti and Somalia to Asmara. When the British army broke through the Italian front and occupied Eritrea, my grandfather was arrested and sent to Addis Ababa to a concentration camp. He escaped by foot and other local means, and made his way back to Asmara. He told me the story of how he escaped – by hiding in the garbage that would be brought out every few days. Q : Your last name resembles that of Sergent Sanguneti who was held as a hostage by Degiat (title) Bahta Hagos in Segeneiti in 1894? Any connection? Q : On your grandmother? My grandmother and I were extremely close. Maybe because I was the daughter she never had, and she was the mother I wish I had had. So, it was necessary for me to go to Eritrea to see her public works with my own eyes. I finally made the trip in October with an Italian tour group of architects and engineers. We flew from Milano to Asmara for a 10-day tour of the country. My grandmother’s autobiography best describes how she felt about Eritrea. She fell in love with the people, landscape…all of it. You can see it in her drawings and paintings on her website. Q : What was/is your impression of your visit to Eritrea? Was it your first visit? The first two days were spent in Asmara. A contact of a friend of mine who works at the Asmara Heritage Project was kind enough to take me around Asmara to see Nenne’s works as well as the city. The first one I came across was at the Agazien School. At first, I was frozen by the image. Then I cried tears of joy and disbelief that these beautiful symbols were right there in front of me, with her signature in the right-hand corner. 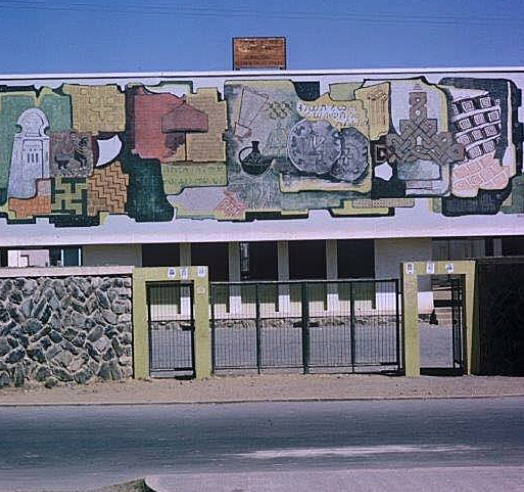 Our next stop was the Enda Mariam Church with its 7 panels. I didn’t cry this time. Once was all I needed. But I was awestruck by the presence it held as you walked up to it, and by the vivacious colors! Absolutely beautiful! Our third stop was at the old Cotonificio Barattolo, with her painted panels gracing the entrance. The manager was still there and kind enough to give us a tour of what is now “Dolce Vita”. Our final stop was her stunning mosaics in the Casciani Chapel at the cemetery looking over the city. We walked the entire city those two days, visiting the historical buildings which make up this world heritage site. As an Italian, I could see the Italian influence left behind…”Little Rome”. But I also saw beautiful people of all ages and all walks of life. I recall seeing a Muslim teenage girl in traditional clothing, walking arm in arm with another teenage girl wearing jeans and no headdress. I got the impression that, no matter what your religion, you would not live separate lives. On the road to Massawa, I would just stare out the window, taking it all in as much as I physically and mentally could. Someone on the trip asked me what I was thinking about. I was thinking about three people: my grandfather, my father and my grandmother. I tried imagining my grandfather, a young man, with adventure in his blood, making the road from Asmara to Tessenei and back again. His epitaph reads “40 years in Africa”. I thought about my father, born here, growing up here, finding adventures to be had with his friends within the mountains, and how much of this far off land he carries with him to this day as he continues to live his lovely life in Philadelphia. And I think about my grandmother…am I looking at something she may have seen too, driven to stop and pull out her sketchbook or return the following day with her paints and easel? I finally felt like I was there with them, the four of us all together in this majestic landscape. It was powerful. It was necessary. Massawa, the port city on the Red Sea, was fascinating but not easy to visit because it is a war-torn city from when the war ended in 1991. I have never seen a war-torn city in person. These beautiful Ottoman and Italian influenced buildings have been severely bombed…and some of them have people living inside. It was so hot that residents would put their cots outside their doors to sleep. The children might be sleeping while the mothers made the ceremonial coffee, in part with hopes of selling one to a passer-by. My wish would be to see a complete restoration of these buildings, not tear them down to rebuild. But I realize the expense that goes with that. Our next stop was Disse of the Dahlak Islands. We arrived during a sandstorm, a very uncomfortable sandstorm, especially if you wear contact lenses. But we slept under the stars. I opted for no tent, just a cot. I have never seen a sky so filled with planets and constellations and shooting stars and a Milky Way you could probably walk on….and a half moon so bright and so low that it woke me up one of the nights. We ate what had been fished that day, and we washed our plates and glasses in the sea with the sand. There was no running water, no bathrooms, no electricity, just 15 people getting to know each other, telling jokes and sharing stories. There are more details I could share of what I saw and what I did, but it was the overall “feel” of this ancient land that captivated me, so much so that I am already thinking of WHEN I will go back. Because when I left, a small part of me felt like I left my grandmother behind. And that is because I have. She is on the church, on the school, on the factory, and certainly on other places I have yet to discover. The most special feeling I walked away with was pride. 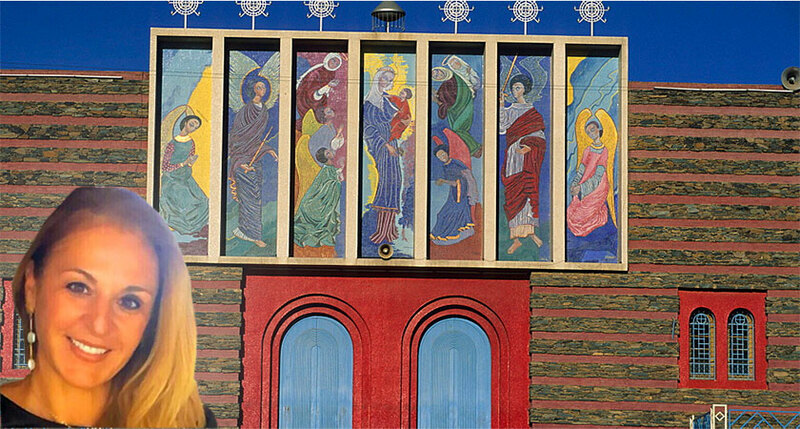 When people learned that I was the granddaughter of the artist who created the panels of the Enda Mariam Church, I could feel the respect they had for her, some also amazed because they never knew who the artist was! 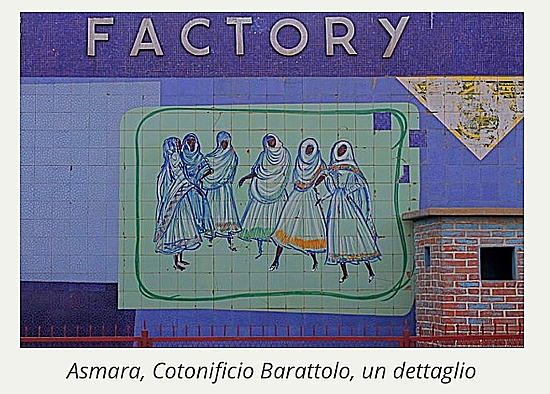 She is a part of Asmara as Asmara was a part of her.